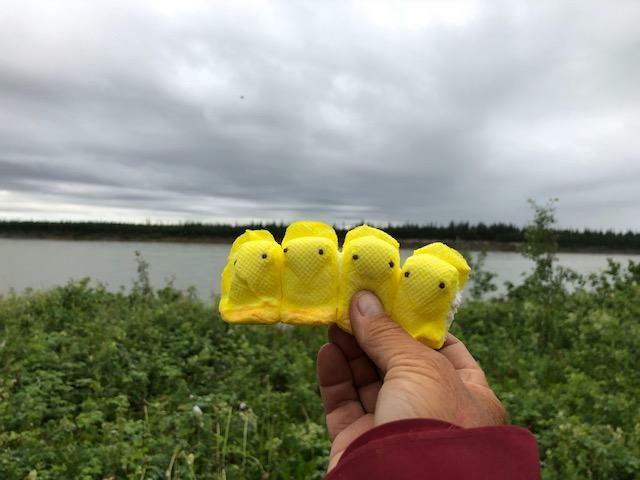 These are peeps over the Mackenzie River and we are now Mackenzie paddling peeps. Tom drove us from Fort Resolution to Fort Providence today and dropped us at the Territorial campground. A friend of his will hopefully help get us from here to the launch in Fort Providence tomorrow. We enjoyed the many conversations we had in Fort Resolution over the past 24 hours and today with Tom while driving. It is a very friendly place and so interesting to hear about lives lived and issues folks are working to solve. 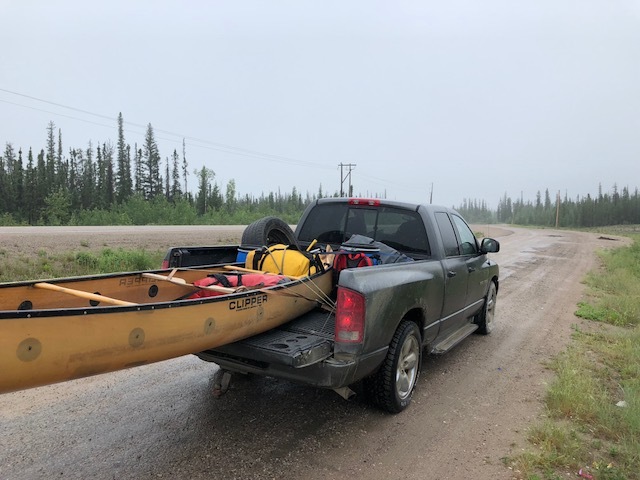 We know we’ll need to go back because the Eastern Arm of Great Slave Lake kept coming up in our conversations and seems like one of those power places not to be missed. 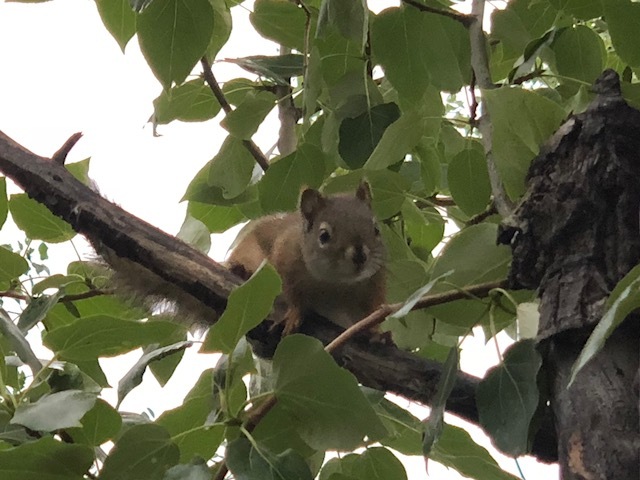 This squirrel was quite eagerly watching us unpack our food re-ration. We’d stopped in Hay River and picked it up. Turns out the cousin or cousins of this critter totally destroyed one of our food boxes and we lost dried corn, berries, coffee, cocoa, oatmeal, cous cous, quinoa, our fancy pants freeze dried meat and chicken and our six week supply of M & M’s, while the boxes were in storage in Hay River. To work through my disappointment, I chased off the squirrel above with great vigour. The good news is that we didn’t eat all of our food in the first ration so our barrels are tip top full once again. We won’t go hungry. Hopefully, all the logistics work tomorrow and we will be back paddling North tomorrow. 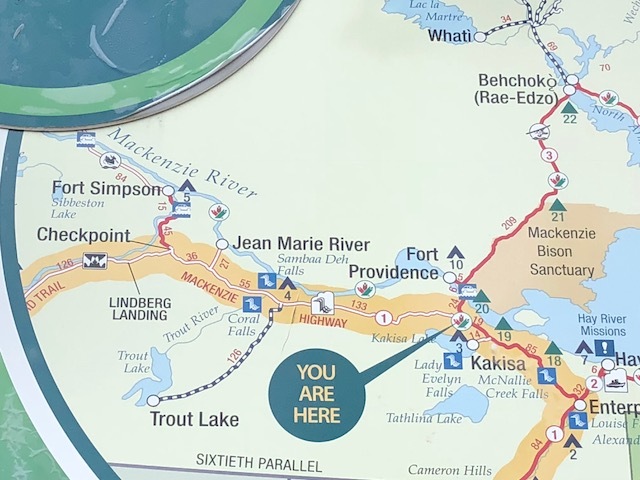 Originally, we were only planning to paddle the Mackenzie (and not the Athabasca and the Slave) so its great to have paddled so much before putting on to Canada’s largest river. It’s day 42 of our trip, today is our six week mark, and we have six more weeks and 1700 kilometres to go! What a hump day! Thanks for going on this adventure with us. Not sure you will get this (would appreciate a “yep” if you do). I am enjoying this adventure with you and Marian. 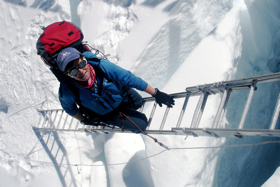 I don’t quite understand the motivation for such a long, arduous adventure, but I don’t have to understand it to enjoy it with you. Thank you for taking the time and putting forth the effort to keep us informed. I’ve looked on my map to find you – can’t imagine what life might be like in that part of the world – would love to go sometime and find out.